In 1920, the National Park Service, the Nation Park-to-Park Highway Association and the American Automobile Association jointly sponsored a tour following the route of an envisioned a Part-to-Park highway linking the twelve National Parks in the western United States. The purpose of the tour was to promote interest by neighboring communities in providing the infrastructure (i.e. : roads and accommodations) to facilitate visitation of the National Parks. It is this route that Jean and I intend to follow as closely as surviving roads will permit. The actual 1920 tour, which proceeds in a counterclockwise fashion from Denver Colorado and back, covered approximately 5,500 miles. If we include Lassen Volcanic and Zion National Parks which were bypassed on the 1920 tour, and adding for some side trips to friends and attractions, our tour will be approximately 7,800 miles plus the driving distance from Raleigh, NC to Denver, CO and back. We hope to complete the adventure in 8 to 10 weeks door to door. As we make final preparations for this once-in-our-lifetime adventure, Jean and I wish to express our thanks to all who have helped make this trip possible through their words of encouragement and tangible assistance. First of all, the idea of recreating the journey of the 1920 Park-to-Park tour of 12 twelve of the western National Parks would never have come to mind had we not watched Brandon Wade’s documentary PAVING THE WAY on UNC-TV, our local Public Television station in 2010 and Lee and Jane Whitely whose book THE PLAYGROUND TRAIL: The National Park-to-Park Highway inspired both the documentary and our aspirations. Secondly, we would assuredly have never fully realized the quest had it not been for the encouragement and diligent efforts of our Mike Petersen, who, with the assistance of Lee Whiteley and his publications, created a point by point set of directions that follow the original route to the best of his ability using available information. 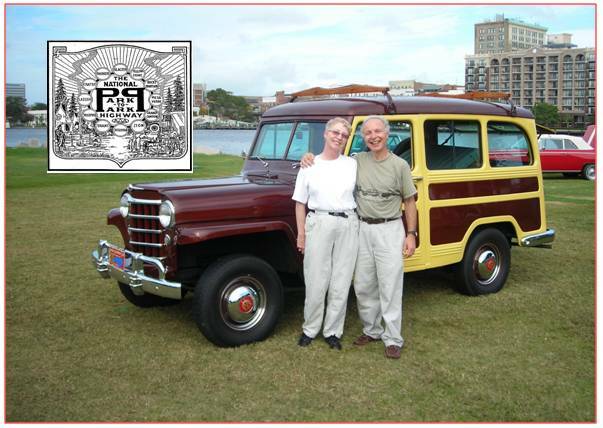 Additionally, we might never have considered attempting this journey in our 1950 Willys Overland Jeep station wagon had it not been for the helpful assistance of many friends and the several automotive parts suppliers and rebuilding services providers that helped us over the 37 years since we first begun the restoration and maintenance of the vehicle. We would be pleased to share our experiences in this regard with others. And finally, we are so grateful to have the support and encouragement of our friends; most of which do not think that we are totally bonkers for undertaking this adventure at 70 years of age. Owing to the interest of many well-wishers (a probably more than a few folks that think we are nuts), Jean and I intend to make daily entries in this blog complete with photographs and video documenting our journey and activities once when our journey commences on August 15, 2013. Until then, we will be making sporadic entries describing the history of our relationship with our Jeep and our preparations for the trip. We hope that you will have time to follow us and we welcome your suggestions as to how to make the trip and the blog more meaningful.